Sri Lanka on Tuesday banned the sale of the latest issue of Time magazine because of the newsweekly’s feature article on terrorism, describing recent clashes between Buddhists and Muslims. Such hate speech threatens the delicate political ecosystem in a country peopled by at least 135 ethnic groups that has only recently been unshackled from nearly half a century of military rule. Already some government officials are calling for implementation of a ban, rarely enforced during the military era, on Rohingya women’s bearing more than two children. And many Christians in the country’s north say recent fighting between the Burmese military and Kachin insurgents, who are mostly Christian, was exacerbated by the widening religious divide. Radical Buddhism is thriving in other parts of Asia too. This year in Sri Lanka, Buddhist nationalist groups with links to high-ranking officialdom have gained prominence, with monks helping orchestrate the destruction of Muslim and Christian property. And in Thailand’s deep south, where a Muslim insurgency has claimed some 5,000 lives since 2004, the Thai army trains civilian militias and often accompanies Buddhist monks when they leave their temples. The commingling of soldiers and monks–some of whom have armed themselves–only heightens the alienation felt by Thailand’s minority Muslims. Although each nation’s history dictates the course radical Buddhism has taken within its borders, growing access to the Internet means that prejudice and rumors are instantly inflamed with each Facebook post or tweet. Violence can easily spill across borders. In Malaysia, where hundreds of thousands of Burmese migrants work, several Buddhist Burmese were killed in June–likely in retribution, Malaysian authorities say, for the deaths of Muslims back in Burma. In the reckoning of religious extremism–Hindu nationalists, Muslim militants, fundamentalist Christians, ultra-Orthodox Jews–Buddhism has largely escaped trial. To much of the world, it is synonymous with nonviolence and loving kindness, concepts propagated by Siddhartha Gautama, the Buddha, 2,500 years ago. But like adherents of any other religion, Buddhists and their holy men are not immune to politics and, on occasion, the lure of sectarian chauvinism. When Asia rose up against empire and oppression, Buddhist monks, with their moral command and plentiful numbers, led anticolonial movements. Some starved themselves for their cause, their sunken flesh and protruding ribs underlining their sacrifice for the laity. Perhaps most iconic is the image of Thich Quang Duc, a Vietnamese monk sitting in the lotus position, wrapped in flames, as he burned to death in Saigon while protesting the repressive South Vietnamese regime 50 years ago. In 2007, Buddhist monks led a foiled democratic uprising in Burma: images of columns of clerics bearing upturned alms bowls, marching peacefully in protest against the junta, earned sympathy around the world, if not from the soldiers who slaughtered them. But where does political activism end and political militancy begin? Every religion can be twisted into a destructive force poisoned by ideas that are antithetical to its foundations. Now it’s Buddhism’s turn. Sitting cross-legged on a raised platform at the New Masoeyein monastery in Mandalay, next to a wall covered by life-size portraits of himself, the Burmese bin Laden expounds on his worldview. U.S. President Barack Obama has “been tainted by black Muslim blood.” Arabs have hijacked the U.N., he believes, although he sees no irony in linking his name to that of an Arab terrorist. 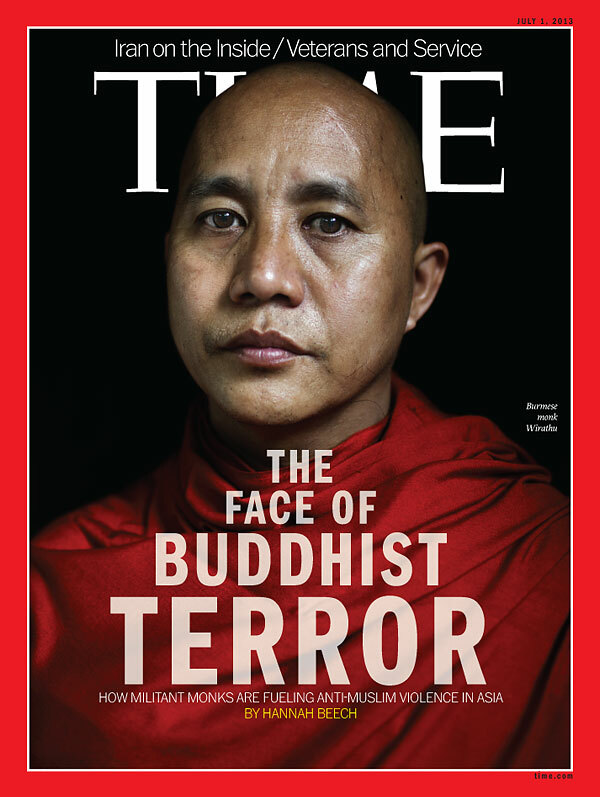 About 90% of Muslims in Burma are “radical, bad people,” says Wirathu, who was jailed for seven years for his role in inciting anti-Muslim pogroms in 2003. He now leads a movement called 969–the figure represents various attributes of the Buddha–which calls on Buddhists to fraternize only among themselves and shun people of other faiths. “Taking care of our own religion and race is more important than democracy,” says Wirathu. It would be easy to dismiss Wirathu as an outlier with little doctrinal basis for his bigotry. But he is charismatic and powerful, and his message resonates. Among the country’s majority Bamar ethnic group, as well as across Buddhist parts of Asia, there’s a vague sense that their religion is under siege–that Islam, having centuries ago conquered the Buddhist lands of Indonesia, Malaysia, Pakistan and Afghanistan, now seeks new territory. Even without proof, Buddhist nationalists stoke fears that local Muslim populations are increasing faster than their own, and they worry about Middle Eastern money pouring in to build new mosques. In Burma, the democratization process that began in 2011 with the junta’s giving way to a quasi-civilian government has also allowed extremist voices to proliferate. The trouble began last year in the far west, where machete-wielding Buddhist hordes attacked Rohingya villages; 70 Muslims were slaughtered in a daylong massacre in one hamlet, according to Human Rights Watch. The government has done little to check the violence, which has since migrated to other parts of the country. In late March, the central town of Meikhtila burned for days, with entire Muslim quarters razed by Buddhist mobs after a monk was killed by Muslims. (The official death toll: two Buddhists and at least 40 Muslims.) Thousands of Muslims are still crammed into refugee camps that journalists are forbidden to enter. In the shadow of a burned-down mosque, I was able to meet the family of Abdul Razak Shahban, one of at least 20 students at a local Islamic school who were killed. “My son was killed because he was Muslim, nothing else,” Razak’s mother Rahamabi told me. In the deep south of Burma’s neighbor Thailand, it is the Buddhists who complain of being targeted for their faith. This part of the country used to be part of a Malay sultanate before staunchly Buddhist Thailand annexed it early last century, and Muslims make up at least 80% of the population. Since a separatist insurgency intensified in 2004, many Buddhists have been targeted because their positions–such as teachers, soldiers and government workers–are linked with the Thai state. Dozens of monks have been attacked too. Now the Buddhists have overwhelming superiority in arms: the Thai military and other security forces have moved into the wat, as Thai Buddhist temples are known. It’s a sentiment the Burmese bin Laden would endorse. I ask Wirathu how he reconciles the peaceful sutras of his faith with the anti-Muslim violence spreading across his Bamar-majority homeland. “In Buddhism, we are not allowed to go on the offensive,” he tells me, as if he is lecturing a child. “But we have every right to protect and defend our community.” Later, as he preaches to an evening crowd, I listen to him compel smiling housewives, students, teachers, grandmothers and others to repeat after him, “I will sacrifice myself for the Bamar race.” It’s hard to imagine that the Buddha would have approved. srilanka is going to be a peaceful country, and will be an example to the whole world, we will work on it and not allow any individual ,groups, institition, organisation, religion, movement or government challenging this survive for long. we will weed it out the srilankan way! duwanna thiyala, wedi thiyenawa. I think it is not accurate to compare Wirathu with bin Laden. Bin Laden fought against those whom he viewed as oppressors. Wirathu is fighting against the oppressed and weak. As a Buddhist, I find this man truly cringeworthy. He should resign as a monk and become a politician. But no-one would listen to him then, would they? Monks have a lot of influence in Myanmar; people worship them. This is the total antithesis of Buddha’s teaching, which says we should find our own truth and not accept something that someone says, even if that someone is in a position of authority, like the Buddha himself. But people are always sheeple everywhere, aren’t they? They have not learned the teachings of Buddha at all, and how can they learn when their teacher is preaching his own religion of hate? Humanity is lost. We need a new teacher now. which is done intentionally to pit, distort the true facts! Confucius (Confucianism.) did not teach things that are contrary to Nature! wherever you go religious people live through the psychology of fear and insecurity of being dominated by others.Same for Buddhist, Christians Hindu Jews Muslim Sikh .They cannot be peaceful by themselves. This man is a complete criminal and terror better than Hitler. these type of people had to be wipe out entirely from public speech, write ups and appearance. While it is tragic that Buddhists would commit violence against anyone, how many religions can live in peace with Muslims? Muslims have persecuted Jews, Christians, Hindus, Bahai faith, Zoroastrians, and many others when they themselves are the majority. Muslims cannot live in peace with any other religions or cultures. Of course, this does not excuse Buddhists or anyone else attacking them. Islam can coexist with other faiths. See: Indonesia, a majority Muslim state that guarantees freedom of religion. Muslims, Christians, Hindus, and Buddhists live pretty well together. It is only relatively “peaceful”. Thousands have died in religious conflicts between Muslims and Christians in Indonesia. The problem doesnt lies in religions,its ib the human itself. soma on Massacre Of The Innocents: Whereto From Here"The killers, the human bombs, are believed to be Lankan Muslim men. Alan on Massacre Of The Innocents: Whereto From HereRightly said Tissaranee! Will the Catholics/Moslems take heed? May be.. we'll hope/pray. anonymous on The Easter Sunday Bombings: A Boon For Gotabaya Rajapaksa The 'Jarapssas' will never come to power again. They are history forgotten. kebab on Massacre Of The Innocents: Whereto From HereVery sad situation. Where can we go except down the drain !